청자 상감포도동자문 매병(靑磁 象嵌葡萄童子文 梅甁)은 고려 시대의 만들어진 청자 상감 매병으로 높이 41.5㎝, 아가리 지름 7.5㎝, 밑지름 15.8㎝의 크기로 매병 가운데 드물게 보이는 큰 작품이다. 술병으로 보이는 매병은 고려의 세련미를 보이며 매우 활발하게 제작되었다. 이 때의 매병과 비교해보면 다리가 길어지고 아가리가 커졌으며, 정선되지 않은 바탕흙, 깨끗하게 마무리 되지 않는 굽다리들로 전성기가 지난 시기에 만든 것으로 짐작된다. 어깨부분에는 비교적 큰 꽃무늬를 상감하였고, 넓은 몸통에는 덩굴 포도잎과 열매로 가득 채웠다. 이들은 모두 백상감으로 나타냈는데, 포도 열매만은 동그란무늬로 도장을 찍듯 새기고, 그 안에 검은 점을 하나씩 상감하여 포도알을 표현하였다. 포도 덩굴 잎새의 백토 상감 부분은 두껍게 도드라져 보이는 특이한 효과를 보여준다. 밑부분은 번개무늬를 연이어 돌렸고, 그 위로는 연꽃잎을 백상감으로 돌렸다. 엷은 녹색이 감도는 회청색의 유약을 두껍게 사용하였다. 전체적으로 고려 매병의 전성기 형식에서 벗어나는 작품이지만, 포도잎의 도드라진 백상감법은 주목할 만 하다. 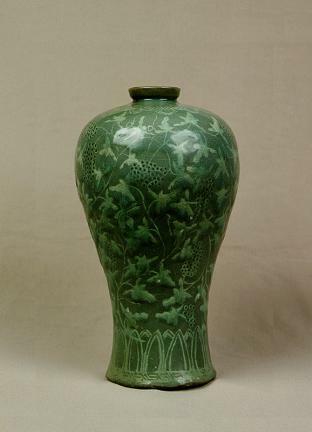 This Celadon Prunus Vase called maebyeong (narrow-mouthed bottle) in Korean has a height of 41.5cm, mouth diameter of 7.5cm and bottom diameter of 15.8cm. This work is one of the biggest narrow-mouthed bottles made in the Goryeo Dynasty. The narrow-mouthed bottle seems to be designed for containing wine with the refined artistry of the Goryeo Dynasty. However, its longer legs, slightly bigger mouth, the carelessness in selection of clay for the base and the rough finish of the bottom indicate that this particular bottle was made after this type of wine bottle became out of fashion. On the part of the shoulder comparatively big flower pattern is inlaid, and grapevine leaves and the fruits fill the broad body. Those were inlaid with white, only the grape grains are expressed as a stamped round print with inlaid black dots. The white clay inlaid into the part of the leaves of the vine make the pattern look thick and prominent. The lower part has a band of lighting pattern all around, and the upper part is inlaid with lotus flowers. The bottle is thickly coated with grayish green glaze.